Popular sandwich shop Subway is offering those of us who don't have anyone to spend the day with on Valentine's Day, a free meal to enjoy by themselves, as a little consolation. From the 10th February, they launch 'Cookies for Cookies', an opportunity to claim a free cookie instore. All you have to do is head over to their website, and simply allow 'cookies' on the cookie notification bar at the top or bottom of the screen. You will then receive an email with a voucher for a free cookie! Simply print the voucher and show it in-store and enjoy. It is while stocks last so be quick! 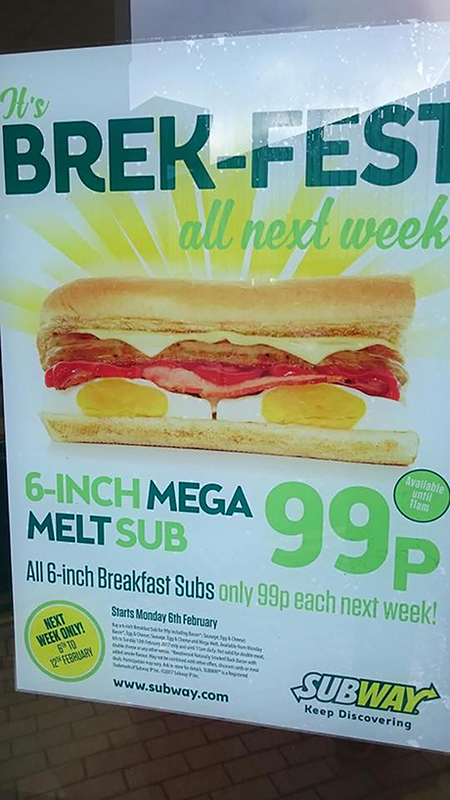 In the build up to the 14th, they were offering a 6-inch mega breakfast sub for just 99p. This is on offer this week, starting today (6th February) until the 1st March, not the 12th Feb as advertised. The second deal they are offering is on the day itself, and we already have a deal page for this but we thought we would mention it anyway. 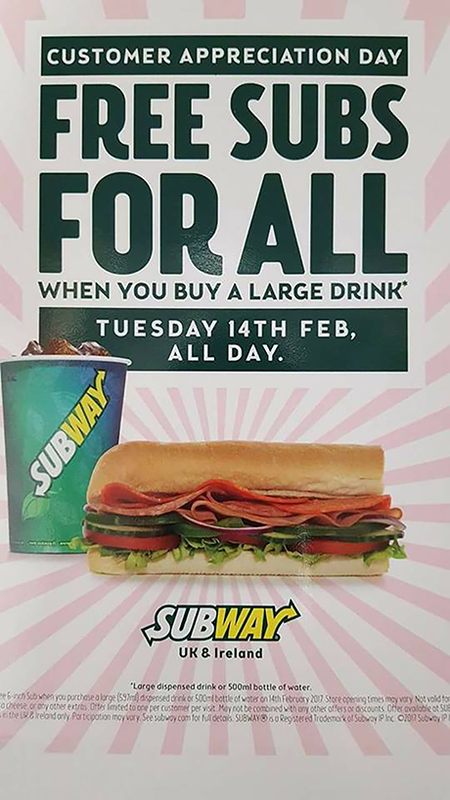 On 14th February, you can get a free 6-inch sub when you buy a large drink. Please read the small print as this offer is only available when you buy a large dispensed drink or bottle of water, so don't try getting a bottle of Coca Cola and then your free sub.